Last year during the probation as UI/UX Developer at Kommdirekt GmbH, a company who specializes in digital branding, online marketing, web solutions and business app, I got to work on the UX Design of a lead capturing application with CREATON, one of the most leading companies who manufacture clay roofing shingle. Yes, I had to google translate the word Tondachziegel first. Long story short, CREATON would attend Dach+Holz 2018 Exhibition, which was held last month. They needed a lead capturing application that can represent their innovative brand. Up til that time, CREATON only relied on papers, pencil, or pens. The problem with traditional lead capturing method is time. A lot of time will be wasted, because at the end of the day the information written in the papers will still need to be entered into the computer, Excel, SAP or whatever. And then what? More time to be wasted to evaluate those information. 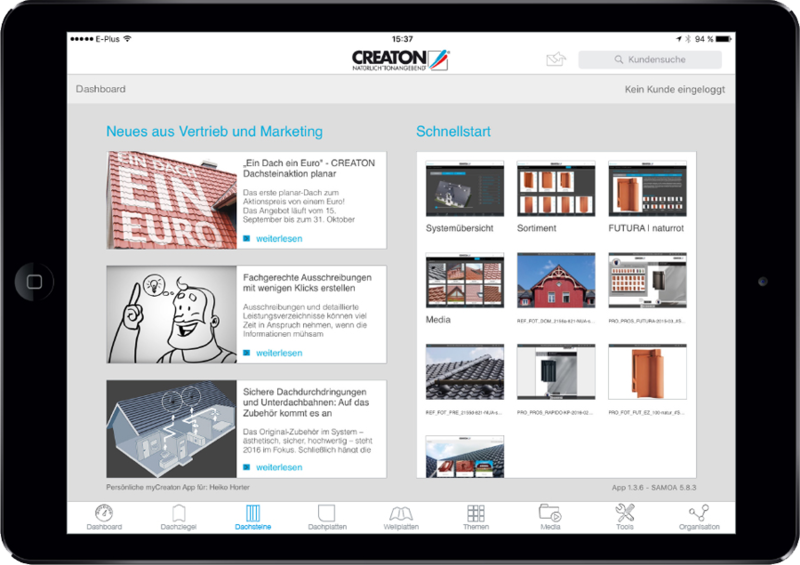 CREATON currently has a business app which is developed by Kommdirekt too. This business app gives users who mainly are sales staffs and distribution partners an access to quick information regarding products and customer information. This app is the starting point to ease the lead capturing process. So a new feature to capture the lead would be implemented inside this app. This feature will automatically sync to Evalanche and then Evalanche will do the job to turn this lead into a new customer. How Can UX Design Help The Process of Lead Capturing? It’s 2018. Lead won’t even bother to sit and write down their information into the paper you give them. Lead won’t bother to fill 1000000 fields in case it’s an app. If there are enough fields, lead doesn’t know which one they must fill or must not. The less field to fill, the better. That’s how our leads think most of the time! The more time you save for each lead, the more leads you shall get. And to solve these problems is my job. So what did I do? Back to basic: understand the existing problems. Mark every field that must be filled! Recheck every field in the app before the app goes live. Some fields only accept numeric characters for some reasons that only the programmer knows. Many techniques can be applied to solve those problems of course. I chose the visual technique. I created mockups and developed a prototype. Remember fields are not the only element that can be found in the app. There are switches, checkboxes, drop-downs, etc. And some of these UI element have logic behind them. You need to think about it too. But how? Creating user flows helped me understanding the logic behind every system that I have built and am currently building. It is not easy to create user flows but you will get better overtime. The app is built. The exhibition is over. Then we received an E-Mail from CREATON stating that they achieved the number of leads that they want to capture. Thanks to UX Design. Thanks to UX Designer? Well that’s what people usually think wrong about UX design. UX Designer is not the only one who design the UX. There are project manager, team leader, visual designer and of course programmer. These people, together with UX designer, are responsible of the amazing UX . Because only one thing is true. Great UX equals to a great product.